Roman Empire at its greatest extent c. 117 AD, with Italy in red and Provinces in green. Evolution of the term "Italia" in antiquity. Following the end of the Social War in 88 BC, Rome had allowed its Italian allies full rights in Roman society and granted Roman citizenship to all the Italic peoples. After having been for centuries the heart of the Roman Empire, from the 3rd century the government and the cultural center began to move eastward: first the Edict of Caracalla in 212 AD extended Roman citizenship to all free men within the imperial boundaries. Then, Christianity became the dominant religion during Constantine's reign (306–337), raising the power of other Eastern political centres. Although not founded as a capital city in 330, Constantinople grew in importance. It finally gained the rank of eastern capital when given an urban prefect in 359 and the senators who were clari became senators of the lowest rank as clarissimi. As a result, Italy began to decline in favour of the provinces, which resulted in the division of the Empire into two administrative units in 395: the Western Roman Empire, with its capital at Mediolanum (now Milan), and the Eastern Roman Empire, with its capital at Constantinople (now Istanbul). In 402, the capital was moved to Ravenna from Milan, confirming the decline of the city of Rome (which was sacked in 410 for the first time in seven centuries). The name Italia covered an area whose borders evolved over time. According to Strabo's Geographica, before the expansion of the Roman Republic, the name was used by Greeks to indicate the land between the strait of Messina and the line connecting the gulf of Salerno and gulf of Taranto (corresponding roughly to the current region of Calabria); later the term was extended by Romans to include the Italian Peninsula up to the Rubicon, a river located between Northern and Central Italy. In 49 BC, with the Lex Roscia, Julius Caesar gave Roman citizenship to the people of the Cisalpine Gaul; while in 42 BCE the hitherto existing province was abolished, thus extending Italy to the north up to the southern foot of the Alps. Under Augustus, the peoples of today's Aosta Valley and of the western and northern Alps were subjugated (so the western border of Roman Italy was moved to the Varus river), and the Italian eastern border was brought to the Arsia in Istria. Lastly, in the late 3rd century, Italy came to include the island of Sicily as well as Corsica and Sardinia, followed by Raetia and part of Pannonia to the north. The city of Emona (modern Ljubljana, Slovenia) was the easternmost town of Italy. Roman Italia (in green) as organized by Augustus. Italia annonaria and Italia suburbicaria dioceses. Italy was privileged by Augustus and his heirs, with the construction, among other public structures, of a dense network of Roman roads. The Italian economy flourished: agriculture, handicraft and industry had a sensible growth, allowing the export of goods to the other provinces. The Italian population may have grown as well: three census were ordered by Augustus, to record the number of Roman citizens throughout the empire. The surviving totals were 4,063,000 in 28 BC, 4,233,000 in 8 BC, and 4,937,000 in AD 14, but it is still debated whether these counted all citizens, all adult male citizens, or citizens sui iuris. Estimates for the population of mainland Italy, including Cisalpine Gaul, at the beginning of the 1st century range from 6,000,000 according to Karl Julius Beloch in 1886, to 14,000,000 according to Elio Lo Cascio in 2009. During the Crisis of the Third Century the Roman Empire nearly collapsed under the combined pressures of invasions, military anarchy and civil wars, and hyperinflation. In 284, emperor Diocletian restored political stability. He carried out thorough administrative reforms to maintain order. He created the so-called Tetrarchy whereby the empire was ruled by two senior emperors called Augusti and two junior vice-emperors called Caesars. He decreased the size of the Roman provinces by doubling their number to reduce the power of the provincial governors. He grouped the provinces into several dioceses (Latin: diocesis) and put them under the supervision of the imperial vicarius (vice, deputy), who was the head of the diocese. During the Crisis of the Third Century the importance of Rome declined because the city was far from the troubled frontiers. Diocletian and his colleagues usually resided in four imperial seats. The Augusti, Diocletian and Maximian, who were responsible for the East and West respectively, established themselves at Nicomedia, in north-western Anatolia (closer to the Persian frontier in the east) and Milan, in northern Italy (closer to the European frontiers) respectively. The seats of the Caesars were Augusta Treverorum (on the River Rhine frontier) for Constantius Chlorus and Sirmium (on the River Danube frontier) for Galerius who also resided at Thessaloniki. In 330, Constantine inaugurated Constantinople. He established the imperial court, a Senate, financial and judicial administrations, as well as the military structures. The new city, however, did not receive an urban prefect until 359 which raised it to the status of eastern capital. After the death of Theodosius in 395 and the subsequent division of the empire Italy was part of the Western Roman Empire. As a result of Alaric's invasion in 402 the western seat was moved from Mediolanum to Ravenna. Alaric, king of Visigoths, sacked Rome itself in 410; something that hadn't happened for eight centuries. Northern Italy was attacked by Attila's Huns in 452. Rome was sacked in 455 again by the Vandals under the command of Genseric. According to Notitia Dignitatum, one of the very few surviving documents of Roman government updated to the 420s, Roman Italy was governed by a praetorian prefect, Prefectus praetorio Italiae (who also governed the Diocese of Africa and the Diocese of Pannonia), one vicarius, and one comes rei militaris. The regions of Italy were governed at the end of the fourth century by eight consulares (Venetiae et Histriae, Aemiliae, Liguriae, Flaminiae et Piceni annonarii, Tusciae et Umbriae, Piceni suburbicarii, Campaniae, and Siciliae), two correctores (Apuliae et Calabriae and Lucaniae et Bruttiorum) and seven praesides (Alpium Cottiarum, Rhaetia Prima and Secunda, Samnii, Valeriae, Sardiniae, and Corsicae). In the fifth century, with the Emperors controlled by their barbarian generals, the Western imperial government maintained weak control over Italy, whose coasts were periodically under attack. In 476, with the abdication of Romulus Augustulus, the Western Roman Empire had formally fallen unless one considers Julius Nepos, the legitimate emperor recognized by Constantinople as the last. He was assassinated in 480He may have been recognized by Odoacer. 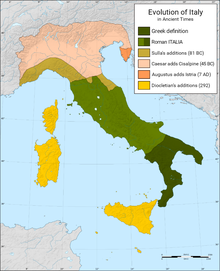 Italy remained under Odoacer and his Kingdom of Italy, and then under the Ostrogothic Kingdom. The Germanic successor states under Odoacer and Theodoric the Great continued to use the Roman administrative machinery, as well as being nominal subjects of the Eastern emperor at Constantinople. In 535 Roman Emperor Justinian invaded Italy which suffered twenty years of disastrous war. In August 554, Justinian issued a Pragmatic sanction which maintained most of the organization of Diocletian. The "Prefecture of Italy" thus survived, and came under Roman control in the course of Justinian's Gothic War. As a result of the Lombard invasion in 568, the Byzantines lost most of Italy, except the territories of the Exarchate of Ravenna - a corridor from Venice to Lazio - and footholds in the south Naples and the toe and heel of the peninsula. ^ Mommsen, Theodor (1855). History of Rome, Book II: From the Abolition of the Monarchy in Rome to the Union of Italy. Leipzig: Reimer & Hirsel. ^ Cassius, Dio. Historia Romana. 41. 36. ^ Laffi, Umberto (1992). "La provincia della Gallia Cisalpina". Athenaeum (in Italian). Firenze (80): 5–23. ^ a b Aurigemma, Salvatore. "Gallia Cisalpina". www.treccani.it (in Italian). Enciclopedia Italiana. Retrieved 14 October 2014. ^ "Italy (ancient Roman territory)". britannica.com. Encyclopædia Britannica. Retrieved 10 November 2013. ^ Hin, Saskia (2007). Counting Romans (PDF). Leiden: Princeton/Stanford Working Papers. ^ Lo Cascio, Elio (2009). Urbanization as a Proxy of Demographic and Economic Growth. Oxford: Scholarship Online. ISBN 9780199562596. Potter, Timothy W. (1990). Roman Italy. Berkeley: University of California Press. ISBN 0-520-06975-7. Salmon, Edward T. (1982). The Making of Roman Italy. Ithaca: Cornell University Press. ISBN 978-0801414381. Whatmough, Joshua (1937). The Foundations of Roman Italy. London: Methuen & Company. Lomas, Kathryn (1996). Roman Italy, 338 BC-AD 200. New York: St. Martin's Press. ISBN 978-0-312-16072-2. Launaro, Alessandro (2011). Peasants and Slaves: The Rural Population of Roman Italy. Cambridge University Press. ISBN 978-1107004795. Hin, Saskia (2013). The Demography of Roman Italy. Cambridge University Press. ISBN 978-1-107-00393-4. Clarke, John R. (1991). The Houses of Roman Italy, 100 BC-AD 250. Berkeley: University of California Press. ISBN 0-520-07267-7. Laurence, Ray (2002). The Roads of Roman Italy: Mobility and Cultural Change. London: Routledge. ISBN 0-415-16616-0.